For your safety, favourable weather conditions are required. 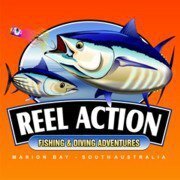 Please contact Glenelg Fishing Charters after 5pm the night prior to your charter to confirm the weather conditions. West Beach Boat Ramp – Adelaide Shores Marina (Barcoo Road, West Beach) – Near the boat ramp, look for our boat! SPECIAL NOTE : As the vessel has a self draining deck, please wear water proof or old shoes as you will get wet feet at the rear of the boat.